Working on catching up with my google reader, I came across a couple giveaways. 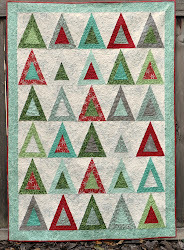 First, go check out the Art Gallery Fabrics blog for a chance to win a copy of Quilts, Quilts, Quilts by Diana McClun and Laura Nownes. I wrote about this book a while back; it's a fabulous learn to quilt book. And... have you heard about Hawthorne Threads yet? It is a new online fabric shop with LOTS of great fabric, and an interesting tiered pricing system. They are giving away a Firenze bag kit (I adore this bag) and some fat quarter packs of Art Gallery Fabrics' Girly Girl line. Go check it out!